Aquamarine promises a 'modern vintage' sound. 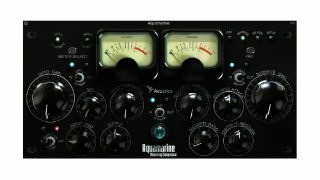 Modelled on a famous mastering compressor, Acustica Audio's new Aquamarine plugin is the latest to be based on the company's nonlinear-convolution Nebula engine. As well as mastering, it's also said to be suitable for a range of mixing tasks. Promising to provide a 'modern vintage' sound, Aquamarine features a switchable transformer input process that offers three tonal variations. Bronze delivers the most colouration, while Silver and Gold each have their own characteristics, too. There's also a preamp 'off' setting for when you're looking for a lighter touch. Aquamarine is actually two compressors running in series. There's a smooth, warm Opto-style compressor that's simple to use and designed to control dynamic range and to 'finesse' your signal, and a VCA-style compressor to add punch. Other features include a high-pass filter and a Mix control that enables onboard parallel compression without the need to set up aux tracks. Said to be suitable for use on full mixes and a wide variety of individual tracks, Aquamarine is available now in 32/64-bit VST/AU formats for PC and Mac. It costs €199 and can be purchased from today via the Acustica Audio website.